This document is a part of the IMS Global Course Management Service (CMS) v1.0.1 specification. The binding details how the Course Management Service Information Model is realised as a Web Service; in the form of a Web Services Description Language (WSDL) file. The CMS binding is contained in a set of WSDL, XSD and vocabulary files. The vocabulary files are instances of the IMS Vocabulary Definition Exchange specification [VDEX, 04a], [VDEX, 04b]. The IMS Global Learning Information Services (LIS) Best Practice and Implementation Guide [LIS, 13b] provides non-normative guidance on how to use the Binding and Information Model. For a conceptual overview of the LIS Specification, please see the overall services description [LIS, 13a]. For a discussion of potential applications, see the Best Practice Guide. IMS Global Learning Information Services Best Practice and Implementation Guide v2.0.1 [LIS, 13b] – key information on how to adopt and implement the specification. This WSDL binding takes the Course Management Service Information Model and produces an encoding of that description in WSDL. This WSDL binding is generated as recommended by the IMS Global General Web Services documents [GWS, 06a], [GWS, 06b]. The WSDL is created using the IMS Global Binding Auto-generation Tool-kit (I-BAT) [I-BAT, 06]. Examples of the SOAP messages that are exchanged to realise the service. IMS Global Course Management Services Information Model Specification v1.0.1 Final Release, L.Feng, B.Lee and C.Smythe, IMS Global Learning Consortium, September 2013. IMS Global General Web Services Base Profile Specification Final Release v1.0, C.Schroeder, J.Simon and C.Smythe, IMS Global Learning Consortium, January 2006. IMS Global General Web Services WSDL Binding Guidelines Final Release v1.0, C.Schroeder, J.Simon and C.Smythe, IMS Global Learning Consortium, January 2006. IMS Binding Auto-generation Toolkit Manual v1.0, C.Smythe, IMS Global Learning Consortium, July 2006. IMS Global Learning Information Services Specification v2.0.1 Final Release , L.Feng, B.Lee and C.Smythe, IMS Global Learning Consortium, September 2013. IMS Global Learning Information Services Best Practice and Implementation Guide v2.0.1 Final Release, L.Feng, B.Lee and C.Smythe, IMS Global Learning Consortium, September 2013. IMS Global Specification Note 11: Vocabulary Definition, Registration & Maintenance Procedures, C.Smythe, IMS Global Learning Consortium, October 2006. 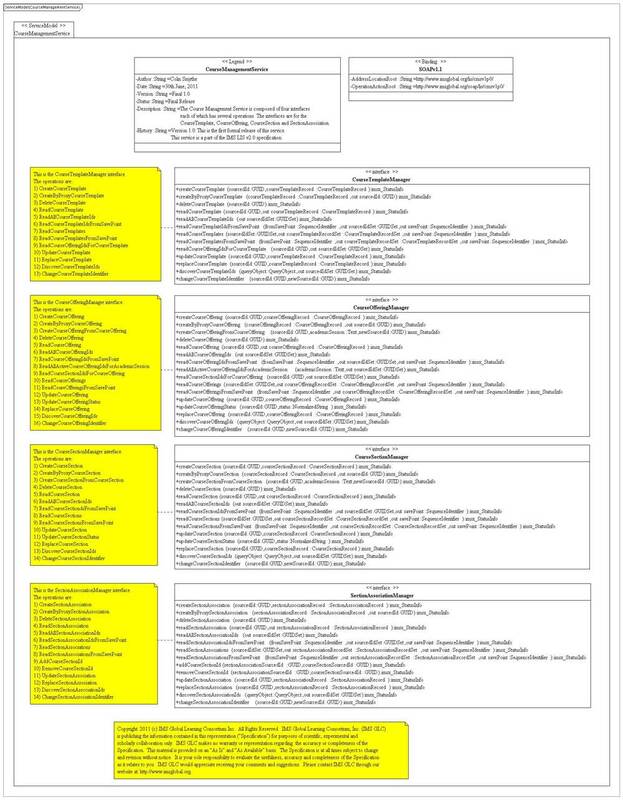 IMS Vocabulary Definition Exchange Information Model Specification Final Release v1.0, A.Cooper, IMS Global Learning Consortium, February 2004. IMS Vocabulary Definition Exchange XML Binding Specification Final Release v1.0, A.Cooper, IMS Global Learning Consortium, February 2004. Figure 2.1 is the PSM of the service group model description for the CMS. This information is used to establish the mapping to the binding flavors of WSDL. Figure 2.1 The PSM representation of the service group model description for the CMS. Figure 2.2 is the PSM of the service model description for the CMS. The PSM is derived from the Platform Independent Model that was documented within the information model for the CMS specification [CMS, 13]. Figure 2.2 The PSM representation of the service model description for the CMS. The data model for the service opertaions is shown in Figure 2.3 and 2.4. Figure 2.3 shows the data models for the set of parameters. Figure 2.4 is the data model for the Status Information and other WSDL-specific binding data structures. Figure 2.3 The PSM representation of the parameters data model description for the CMS. 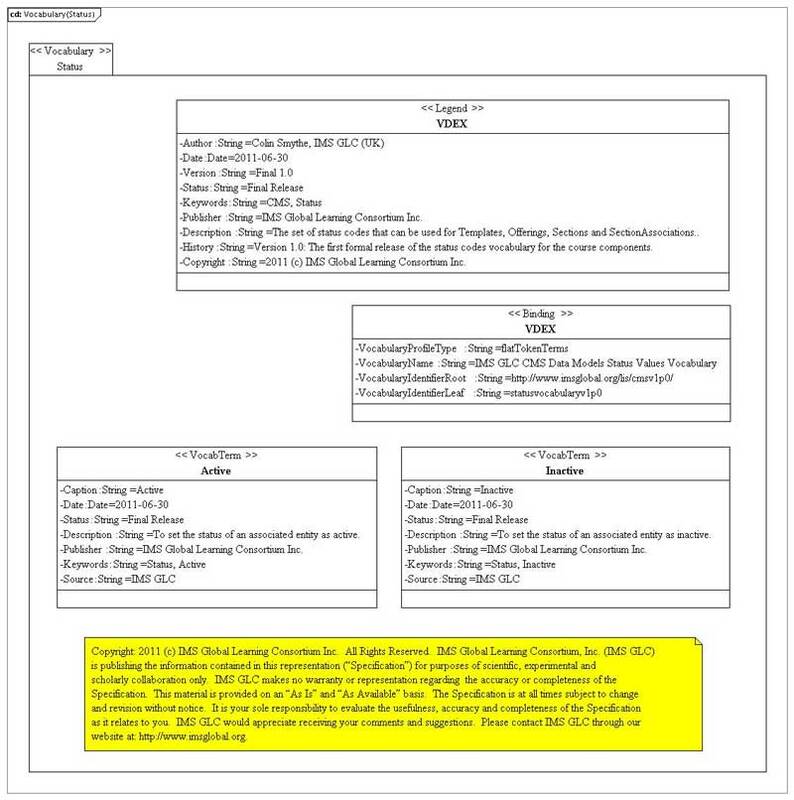 Figure 2.4 The PSM representation of the status information data model description for the CMS. 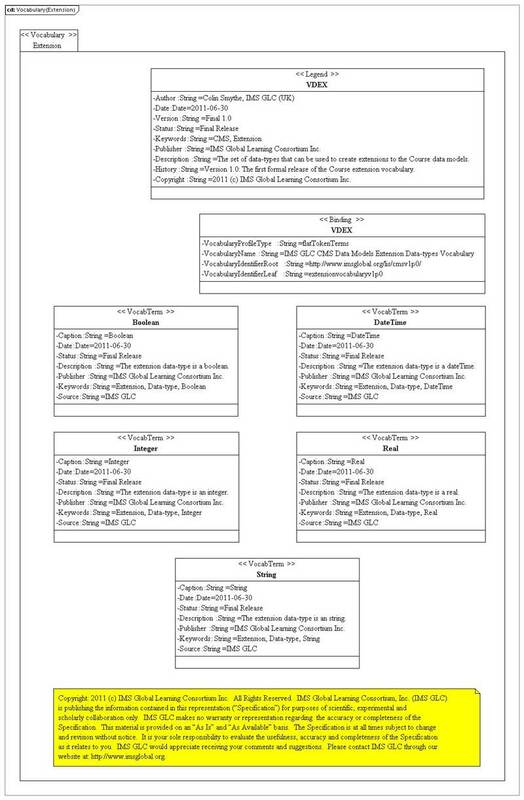 The PSM for the Course data models are shown in Figures 2.5, 2.6, 2.7, 2.8 and 2.9. 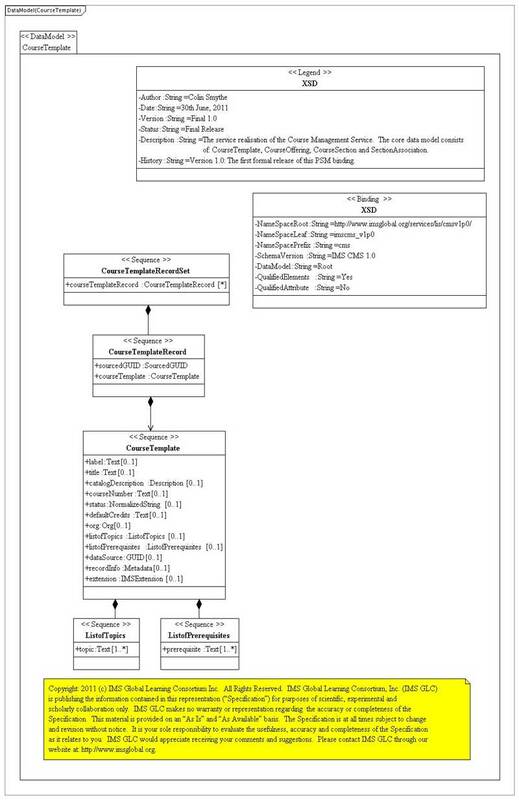 Figure 2.5 is the CourseTemplate data model, Figure 2.6 is the CourseOffering data model, Figure 2.7 is the CourseSection data model, Figure 2.8 is the SectionAssociation data model and Figure 2.9 contains the set of common data model classes. 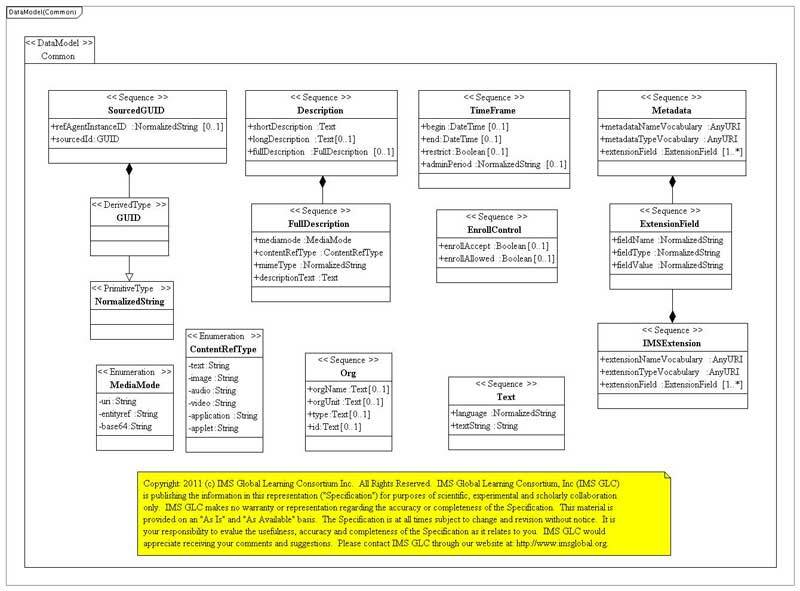 Figure 2.5 The PSM representation of the CourseTemplate data model description for the CMS. 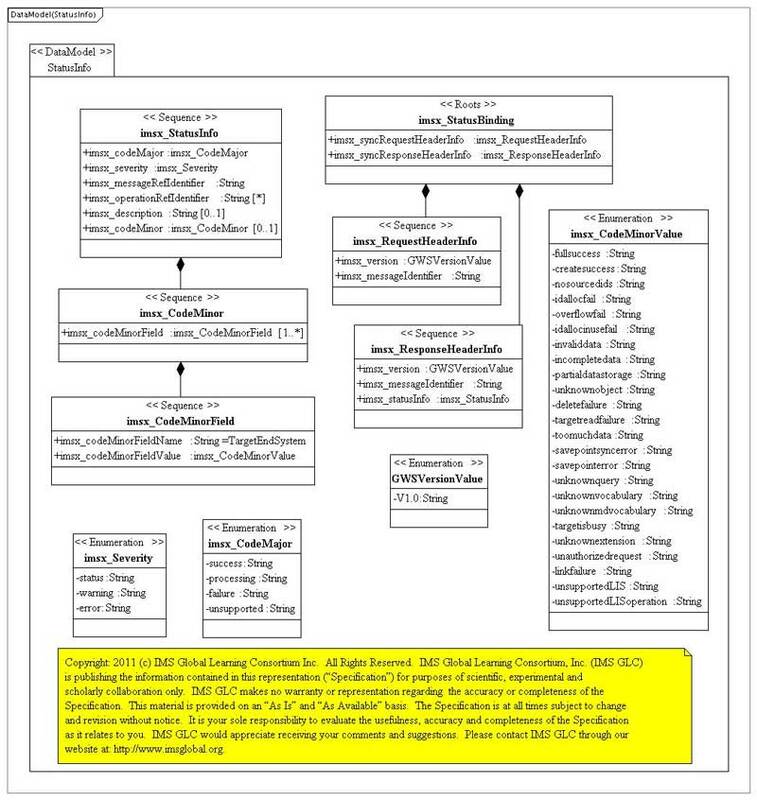 Figure 2.6 The PSM representation of the CourseOffering data model description for the CMS. 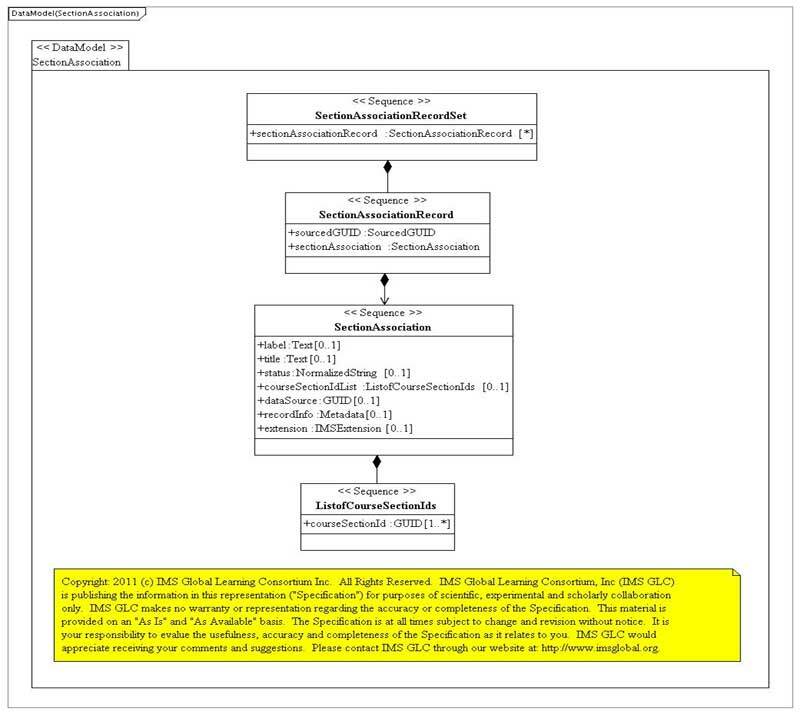 Figure 2.7 The PSM representation of the CourseSection data model description for the CMS. Figure 2.8 The PSM representation of the SectionAssociation data model description for the CMS. 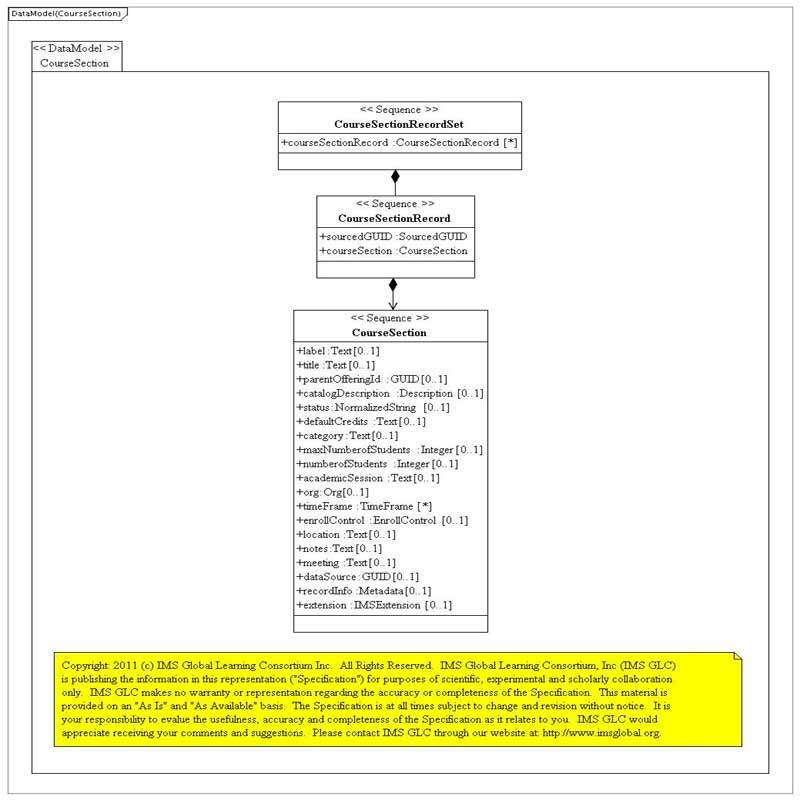 Figure 2.9 The PSM representation of the common data models description for the CMS. The PSM for the file-based Course data models are shown in Figures 2.10, 2.11, 2.12, 2.13 and 2.14. 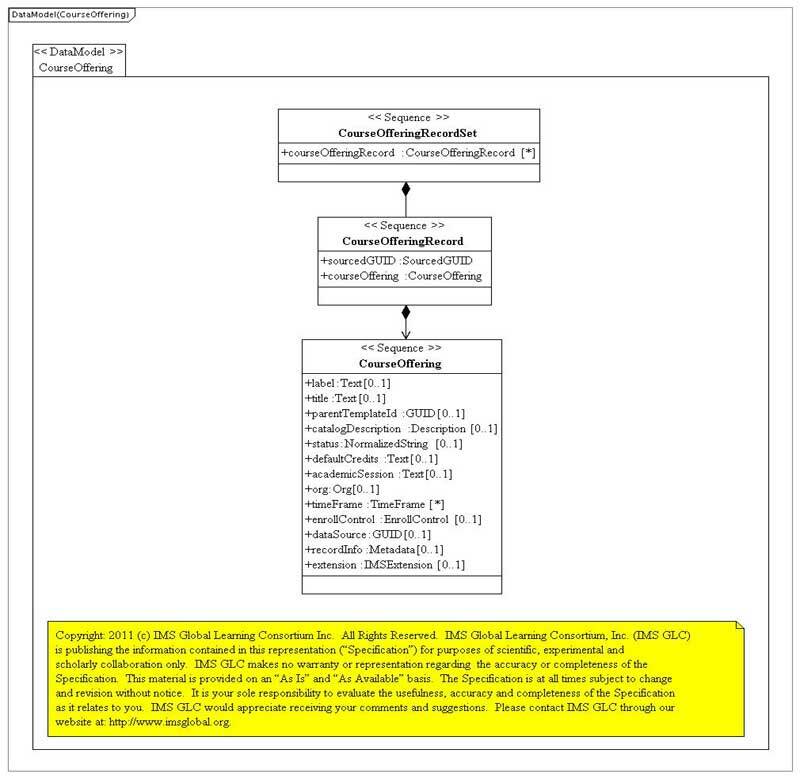 Figure 2.10 is the CourseTemplateRecord data model, Figure 2.11 is the CourseOfferingRecord data model, Figure 2.12 is the CourseSectionRecord data model, Figure 2.13 is the SectionAssociationRecord data model and Figure 2.14 contains the set of common data model classes. 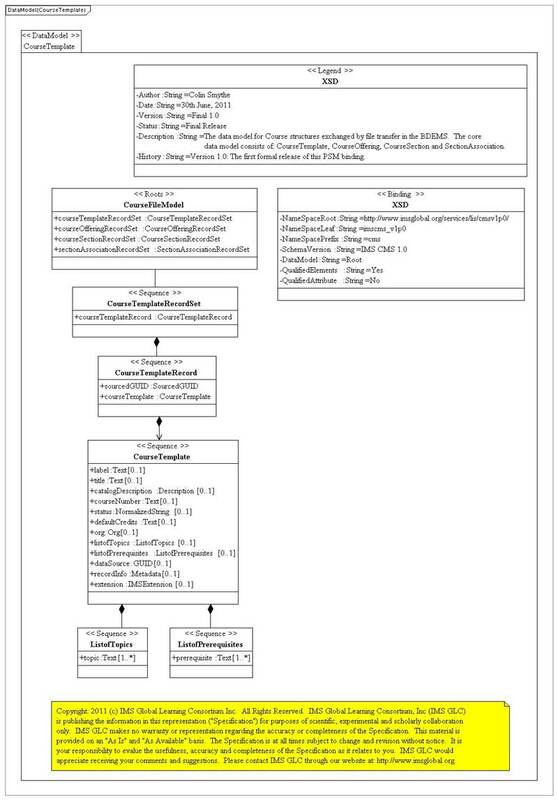 Figure 2.10 The PSM representation of the CourseTemplateRecord data model description for file storage in the CMS. 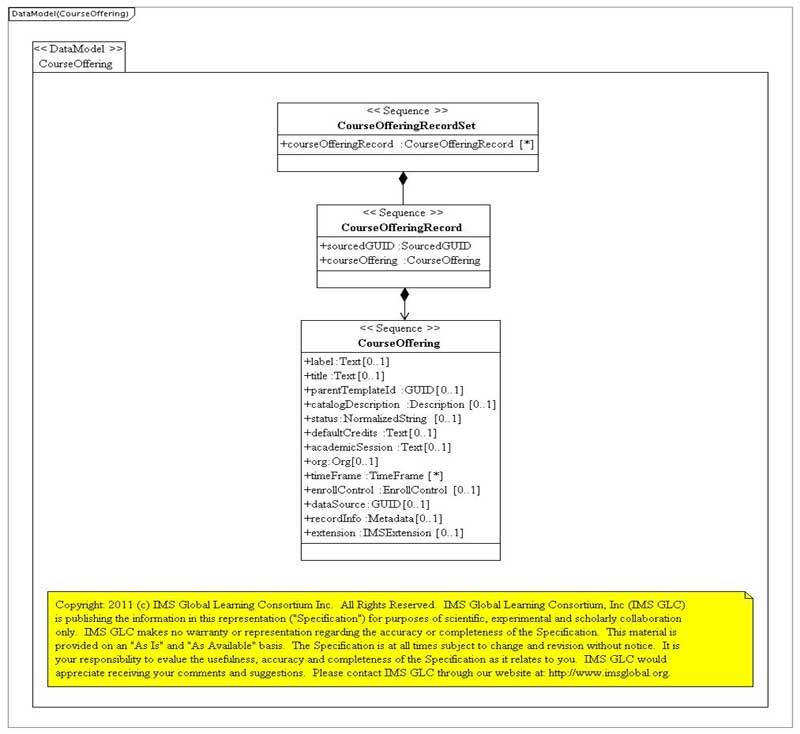 Figure 2.11 The PSM representation of the CourseOfferingRecord data model description for file storage in the CMS. 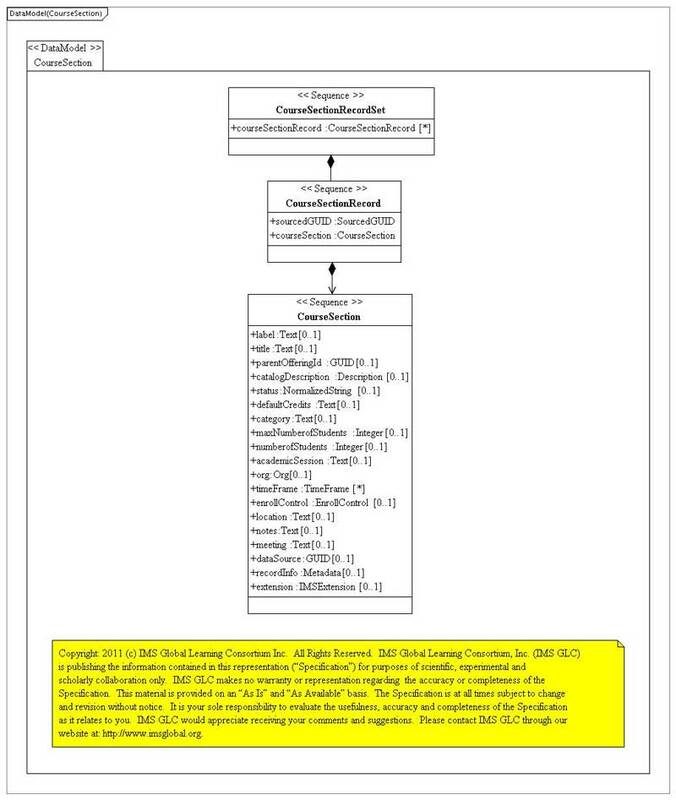 Figure 2.12 The PSM representation of the CourseSectionRecord data model description for file storage in the CMS. 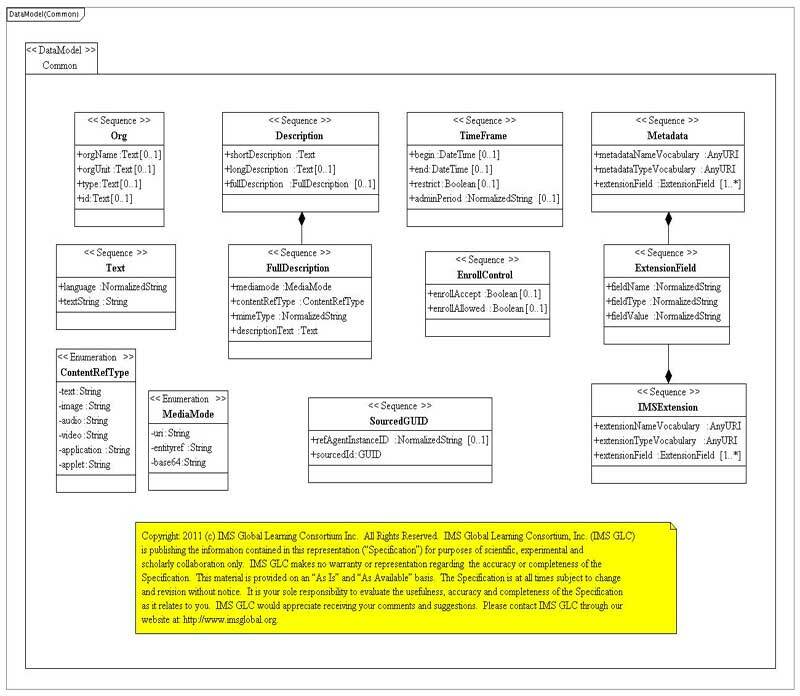 Figure 2.13 The PSM representation of the SectionAssociationRecord data model description for file storage in the CMS. Figure 2.14 The PSM representation of the common data model description for file storage in the CMS. Separated WSDL and XSD files – CourseManagementServicev1p0_SyncWSDL_v1p0.wsdl and CourseManagementServiceSyncXSD.xsd respectively. It is recommended that only the combined form is used (many WSDL-based code generation tools do not process the 'import' instructions). The mapping between the PIM and PSM descriptions is detailed in Table 3.1. Table 3.1 Mapping between the PIM, PSM and XSD descriptions for the data models. a. Type – the type of XSD construct i.e. either a ComplexType or Element. Description: The Course Management Service. This is a part of the IMS Learning Information Services (LIS) v2.0 specification. History: Version 1.0: This is the first formal release of this service. This service was not a part of the IMS Enterprise Services v1.0. WSDL Binding: WSDL Binding is based upon the IMS General Web Services Base Profile v1.0 The IMS GWS Basic Profile is derived from the WS-I Basic Profile v1.1. This profile uses: WSDL 1.1, SOAP 1.1, HTTP 1.1 and XML 1.0. Extension profiles to the IMS GWS Base Profile are available but are not supported using this tool version. 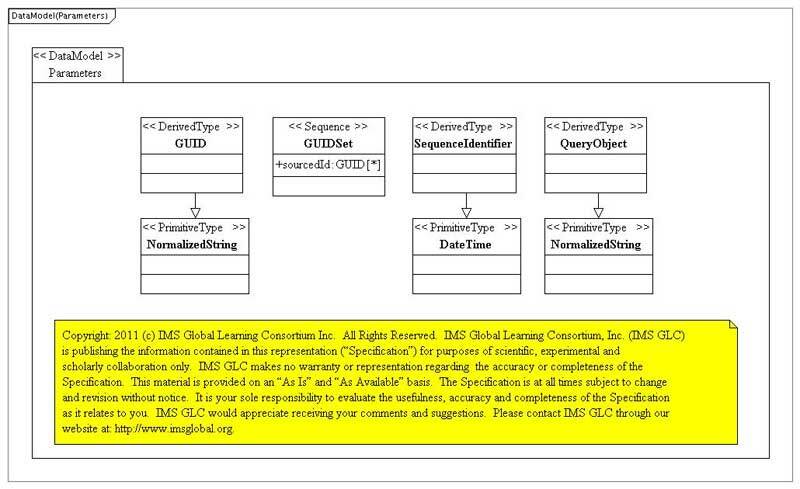 This machine readable file is derived from IMS Global Learning Consortium (GLC) specification IMS Global Course Management Service Version 1.0 found at http://www.imsglobal.org/lis/cmsv1p0/imscmsv1p0_InfoPDv1.pdf and the original IMS schema binding or code base http://www.imsglobal.org/lis/cmsv1p0/imscmsv1p0_BindPDv1.html. Recipients of this document are requested to submit, with their comments, notification of any relevant patent claims or other intellectual property rights of which they may be aware that might be infringed by the schema binding contained in this document. IMS Global takes no position regarding the validity or scope of any intellectual property or other rights that might be claimed to pertain to the implementation or use of the technology described in this document or the extent to which any license under such rights might or might not be available; neither does it represent that it has made any effort to identify any such rights. Information on IMS Globals procedures with respect to rights in IMS Global specifications can be found at the IMS Global Intellectual Property Rights web page: http://www.imsglobal.org/ipr/imsipr_policyFinal.pdf. Copyright © IMS Global Learning Consortium 1999-2011. All Rights Reserved. Users of products or services that include this document are hereby granted a worldwide, royalty-free, non-exclusive license to use this document. Developers of products or services that are not original incorporators of this document and have not changed this document, that is, are distributing a software product that incorporates this document as is from a third-party source other than IMS, are hereby granted permission to copy, display and distribute the contents of this document in any medium for any purpose without fee or royalty provided that you include this IPR, License and Distribution notice in its entirety on ALL copies, or portions thereof. If you wish to create and distribute a derived work from this document, you are hereby granted permission to copy, display and distribute the contents of the derived work in any medium for any purpose without fee or royalty provided that you include this IPR, License and Distribution notice in its entirety on ALL copies, or portions thereof, that you make and you complete a valid profile registration with IMS Global and receive an email from IMS Global granting the license. To register, follow the instructions on the IMS GLC website: http://www.imsglobal.org/profile/. Once registered you are granted permission to transfer unlimited distribution rights of the derived work for the purposes of third-party or other distribution of your product or service that incorporates the derived work as long as this IPR, License and Distribution notice remains in place in its entirety. The limited permissions granted above are perpetual and will not be revoked by IMS Global or its successors or assigns. THIS SPECIFICATION IS BEING OFFERED WITHOUT ANY WARRANTY WHATSOEVER, AND IN PARTICULAR, ANY WARRANTY OF NONINFRINGEMENT IS EXPRESSLY DISCLAIMED. ANY USE OF THIS SPECIFICATION SHALL BE MADE ENTIRELY AT THE IMPLEMENTERS OWN RISK, AND NEITHER THE CONSORTIUM NOR ANY OF ITS MEMBERS OR SUBMITTERS, SHALL HAVE ANY LIABILITY WHATSOEVER TO ANY IMPLEMENTER OR THIRD PARTY FOR ANY DAMAGES OF ANY NATURE WHATSOEVER, DIRECTLY OR INDIRECTLY, ARISING FROM THE USE OF THIS SPECIFICATION. This file was auto-generated using the IMS Global Binding Auto-generation Tool-kit (I-BAT). While every attempt has been made to ensure that this tool auto-generates the files correctly, users should be aware that this is an experimental tool. Permission is given to make use of this tool. IMS Global makes no claim on the materials created by third party users of this tool. Details on how to use this tool are contained in the IMS Global "I-BAT" Documentation available at the IMS Global web-site. Tool Copyright: 2005-2011 (c) IMS Global Learning Consortium Inc. All Rights Reserved. Description: The Course Management Service is composed of four interfaces each of which has several operations. The 'createCourseTemplate' operation is responsible for creating a new CourseTemplate object on the service provider. The service consumer supplies the 'sourcedId' to be used to identify the new CourseTemplate. The 'createByProxyCourseTemplate' operation is responsible for creating a new CourseTemplate object on the service provider. The service provider supplies the 'sourcedId' to be used to identify the new CourseTemplate. The 'deleteCourseTemplate' operation deletes the identified CourseTemplate object. This means the 'sourcedId' can then be reused for another object. The 'readCourseTemplate' operation requests the service provider to return all of the data stored for the identified CourseTemplate object. The 'readAllCourseTemplateIds' operation requests the service provider to return the SourcedIds for all of the CourseTemplate objects. The 'readCourseTemplateIdsFromSavePoint' operation requests the service provider to return the SourcedIds for all of the CourseTemplate objects from the defined reference 'savePoint'. The 'readCourseTemplates' operation requests the service provider to return all of the data stored for the identified set of CourseTemplate objects. The 'readCourseTemplatesFromSavePoint' operation requests the service provider to return all of the data stored for the identified set of CourseTemplate objects from the defined reference 'savePoint'. The 'readCourseOfferingIdsForCourseTemplate' operation requests the service provider to return the SourcedIds for all of the CourseOffering objects for the identified CourseTemplate. The 'updateCourseTemplate' operation is responsible for changing the CourseTemplate object on the service provider by making an additive write to the previously stored data. The 'replaceCourseTemplate' operation is responsible for changing the CourseTemplate object on the service provider by making a destructive replacement of all the previously stored data. If the original object cannot be found, this operation acts as if it was a 'createCourseTemplate' operation call. The 'discoverCourseTemplateIds' operation requests the service provider to return the SourcedIds of all of the CourseTemplate objects that sustain the query criteria. At present, there is no defined format for the query i.e. the query is passed as a string. The 'changeCourseTemplateIdentifier' operation enables the service consumer to change the 'SourcedId' assigned to a CourseTemplate object on a service provider. The 'createCourseOffering' operation is responsible for creating a new CourseOffering object on the service provider. The service consumer supplies the 'sourcedId' to be used to identify the new CourseOffering. The 'createByProxyCourseOffering' operation is responsible for creating a new CourseOffering object on the service provider. The service provider supplies the 'sourcedId' to be used to identify the new CourseOffering. The 'createCourseOfferingFromCourseOffering' operation is responsible for creating a new CourseOffering object by using an existing CourseOffering as the base. The service consumer supplies the 'sourcedId' to be used to identify the new CourseOffering. 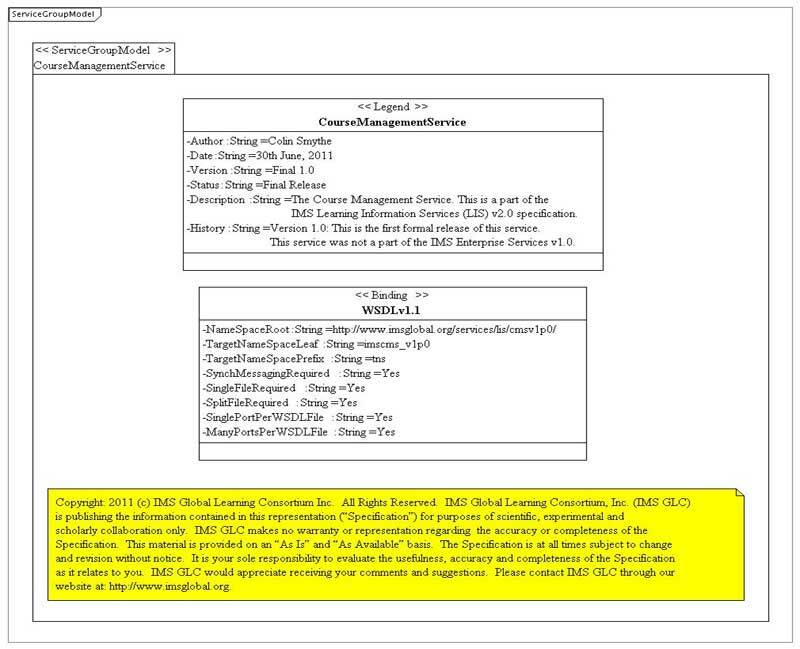 The 'deleteCourseOffering' operation deletes the identified CourseOffering object. This means the 'sourcedId' can then be reused for another object. The 'readCourseOffering' operation requests the service provider to return all of the data stored for the identified CourseOffering object. The 'readAllCourseOfferingIds' operation requests the service provider to return the SourcedIds for all of the CourseOffering objects. The 'readCourseOfferingIdsFromSavePoint' operation requests the service provider to return the SourcedIds for all of the CourseOffering objects from the defined reference 'savePoint'. The 'readAllActiveCourseOfferingIdsForAcademicSession' operation requests the service provider to return the SourcedIds for all of the CourseOffering objects which are 'active' and which are for the identified 'academic session'. The 'readCourseSectionIdsForCourseOffering' operation requests the service provider to return the SourcedIds for all of the CourseSection objects from the identified CourseOffering. The 'readCourseOffering' operation requests the service provider to return all of the data stored for the identified set of CourseOffering objects. The 'readCourseOfferingsFromSavePoint' operation requests the service provider to return all of the data stored for the identified set of CourseOffering objects from the defined reference 'savePoint'. The 'updateCourseOffering' operation is responsible for changing the CourseOffering object on the service provider by making an additive write to the previously stored data. The 'updateCourseOfferingStatus' operation is responsible for changing the CourseOffering status to the new supplied value. The 'replaceCourseOffering' operation is responsible for changing the CourseOffering object on the service provider by making a destructive replacement of all the previously stored data. If the original object cannot be found, this operation acts as if it was a 'createCourseOffering' operation call. The 'discoverCourseOfferingIds' operation requests the service provider to return the SourcedIds of all of the CourseOffering objects that sustain the query criteria. At present, there is no defined format for the query i.e. the query is passed as a string. The 'changeCourseOfferingIdentifier' operation enables the service consumer to change the 'SourcedId' assigned to a CourseOffering object on a service provider. The 'createCourseSection' operation is responsible for creating a new CourseSection object on the service provider. The service consumer supplies the 'sourcedId' to be used to identify the new CourseSection. The 'createByProxyCourseSection' operation is responsible for creating a new CourseSection object on the service provider. The service provider supplies the 'sourcedId' to be used to identify the new CourseSection. The 'createCourseSectionFromCourseSection' operation is responsible for creating a new CourseSection object by using an existing CourseSection as the base. The service consumer supplies the 'sourcedId' to be used to identify the new CourseSection. The 'deleteCourseSection' operation deletes the identified CourseSection object. This means the 'sourcedId' can then be reused for another object. The 'readCourseSection' operation requests the service provider to return all of the data stored for the identified CourseSection object. The 'readAllCourseSectionIds' operation requests the service provider to return the SourcedIds for all of the CourseSection objects. The 'readCourseSectionIdsFromSavePoint' operation requests the service provider to return the SourcedIds for all of the CourseSection objects from the defined reference 'savePoint'. The 'readCourseSection' operation requests the service provider to return all of the data stored for the identified set of CourseSection objects. The 'readCourseSectionsFromSavePoint' operation requests the service provider to return all of the data stored for the identified set of CourseSection objects from the defined reference 'savePoint'. The 'updateCourseSection' operation is responsible for changing the CourseSection object on the service provider by making an additive write to the previously stored data. The 'updateCourseSectionStatus' operation is responsible for changing the CourseSection status to the new supplied value. The 'replaceCourseSection' operation is responsible for changing the CourseSection object on the service provider by making a destructive replacement of all the previously stored data. If the original object cannot be found, this operation acts as if it was a 'createCourseSection' operation call. The 'discoverCourseSectionIds' operation requests the service provider to return the SourcedIds of all of the CourseTemplate objects that sustain the query criteria. At present, there is no defined format for the query i.e. the query is passed as a string. The 'changeCourseSectionIdentifier' operation enables the service consumer to change the 'SourcedId' assigned to a CourseSection object on a service provider. The 'createSectionAssociation' operation is responsible for creating a new SectionAssociation object on the service provider. The service consumer supplies the 'sourcedId' to be used to identify the new SectionAssociation. The 'createByProxySectionAssociation' operation is responsible for creating a new CourseTemplate object on the service provider. The service provider supplies the 'sourcedId' to be used to identify the new SectionAssociation. The 'deleteSectionAssociation' operation deletes the identified SectionAssociation object. This means the 'sourcedId' can then be reused for another object. The 'readSectionAssociation' operation requests the service provider to return all of the data stored for the identified SectionAssociation object. The 'readAllSectionAssociationIds' operation requests the service provider to return the SourcedIds for all of the SectionAssociation objects. The 'readSectionAssociationIdsFromSavePoint' operation requests the service provider to return all of the identifiers for the set of SectionAssociation objects from the defined reference 'savePoint'. The 'readSectionAssociations' operation requests the service provider to return all of the data stored for the identified set of SectionAssociation objects. The 'readSectionAssociationsFromSavePoint' operation requests the service provider to return all of the data stored for the identified set of SectionAssociation objects from the defined reference 'savePoint'. The 'addCourseSectionId' operation requests the service provider to add a new CourseSection to the identified SectionAssociation. The 'removeCourseSectionId' operation requests the service provider to remove a CourseSection from the identified SectionAssociation. The 'updateSectionAssociation' operation is responsible for changing the SectionAssociation object on the service provider by making an additive write to the previously stored data. The 'replaceSectionAssociation' operation is responsible for changing the SectionAssociation object on the service provider by making a destructive replacement of all the previously stored data. If the original object cannot be found, this operation acts as if it was a 'createSectionAssociation' operation call. The 'discoverSectionAssociationIds' operation requests the service provider to return the SourcedIds of all of the SectionAssociation objects that sustain the query criteria. At present, there is no defined format for the query i.e. the query is passed as a string. The 'changeSectionAssociationIdentifier' operation enables the service consumer to change the 'SourcedId' assigned to a SectionAssociation object on a service provider. The XSD file documentation has been produced by the Oxygen XML Editing tool. Click on the Section header to access this documentation for the data models in the service description. Click on the Section header to access this documentation for the data models for the exchange of Group objects in an external file. Extension data-type vocabulary – the set of data-types that are permitted for extensions in the Course data model. The PSM for the extension data-type vocabulary is shown in Figure 6.2. These vocabularies are the default set maintained under the IMS Global Vocabulary Registry [SDN11, 06]. It is the responsibility of an implementation to ensure that it is using the correct and latest versions of the vocabulary files. Changes to the default vocabularies are permitted; this results in the creation of a new vocabulary that should be registered with IMS Global. As part of a profiling process entirely new vocabularies may be defined to replace the default set. Figure 6.1 The PSM representation of the status vocabulary for the CMS. Figure 6.2 The PSM representation of the extension data-type vocabulary for the CMS. The single WSDL file (used in conjunction with the separate XSD file) is available to LIS Alliance members. Click here to join the Alliance. Also available to Alliance members are combined WSDL/XSD files but where each file describes a single interface/port. These files were generated by the I-BATv0.9.5 tool using the PSM representation described in Section 2. The XSD for the external data file (exchanged as part of the BDEMS) – imscms_filemodel_v1p0.xsd. This file was generated by the I-BATv0.9.5 tool using the PSM representation described in Section 2. Documentation of the XSDs is supplied in Section 5. Language codes – languagecodesvocabularyv1p0p1.xml. The set of codes used to identifiy the langage for a string (based upon RFC4646). These vocabularies are each expressed as an instance of the IMS Global Vocabulary Data Exchange (VDEX) v1.0 specification. Documentation of the vocabulary is supplied in Section 6. The online versions of these vocabularies are available in the directory: http://www.imsglobal.org/vdex/lis/cmsv1p0/. The set of examples for the SOAP messages are listed in Tables D.1 (CourseTemplate), D.2 (Course Offering), D.3 (Course Section) and D.4 (Section Association). Table D.1 The set of SOAP message examples for each operation for the CourseTemplate port.